Southern Africa, Australia, New Zealand, OR, WA, CA, British Columbia, Chile according to USDA-ARS. One record of naturalization from Santa Cruz County in 1980. CCH (0). Consortium of California Herbaria. Listed as a noxious weed in Victoria, Australia and Western Australia. "Occurs but is not important" in New South Wales, except for a few areas where it is locally abundant. Parsons and Cuthbertson don't describe ecological impacts, except to say that it encroaches on pastures from shady sites on forest edges. Invasive in New Zealand (on list of weeds controlled by land managers due to environmental impacts) but no information on where. Species not listed in Global Biodiversity Information Facility maps. Parsons, W.T.., & Cuthbertson E.G.. (2001). Noxious Weeds of Australia. Howell, C. (2008). Consolidated list of environmental weeds in New Zealand. 1-42. Several of the points in New Zealand are in areas that match California, based on Cal-IPC's climate map (in the mountains on the South Island). Locations in Victoria and New South Wales match California. Listed confidence as medium because of uncertainty about the level of impacts. Hypericum canariense and Hypericum perforatum are invasive in California. Native range includes northern Africa and temperate Asia, in areas that mostly match California. Native range in Europe spreads over areas that match California and others that do not. Naturalized areas in Australia are mostly similar to California; in New Zealand mostly do not match California. Oregon and much of British Columbia match California as does Lesotho (southern Africa). In Victoria, overgrazed hillsides have been covered. It can also establish in undisturbed areas and competes strongly with native plants. Example of one population in Victoria extending hundreds of meters from a road into undisturbed brush. No mention of this so default answer is no. Was previously used as a medicinal plant. Has been suspected of poisoning cattle but this is not well documented. Plant is unpalatable and rarely eaten so poisoning not a significant problem to livestock. Answering yes due to suspected poisoning and being unpalatable. Can form dense stands covering hillsides. Grows about 1m tall, which seems tall enough to block movement. Reproduces by seed. Also noted to reproduce vegetatively in its native range (http://e-ecodb.bas.bg/rdb/en/vol1/Hypandro.html). 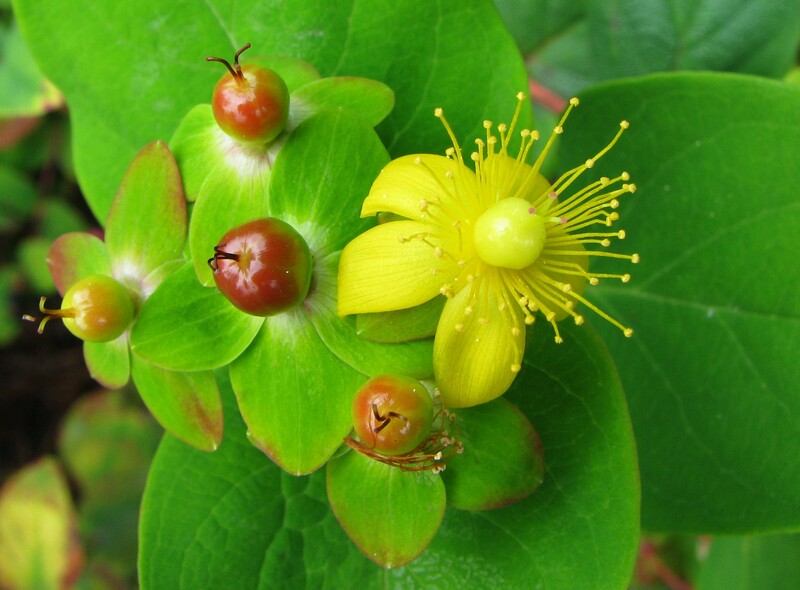 The Washington Noxious Weed Board website says that Hypericum perforatum can produce 100,000 seeds each year (http://www.nwcb.wa.gov/weeds/common-st-johnswort). This seems reasonable given the size of the seeds, capsules, and number of flowers. From my experience with H. canariense and other Hypericum species it seems highly likely that H. androsaeumum would produce >1,000 seeds in a year (Tim Hyland pers. comm.). Fruit ripen in late summer, seeds germinate in autumn (I'm assuming this means the seeds from the same year, no mention of overwintering requirement). Plants flower when they are 18 months to 2 years old. In Australia, flowers are produced late spring to early summer and fruit ripen in late summer. In California, where it's an occasional escape from gardens, flowering time listed as June, so answering no based on that information. Spread is mostly by seed. Not specially adapted for dispersal but its small size and large numbers allow it to contaminate equipment, animals, water, and mud.